Fire are often considered disasters when they destroy infrastructure and lives (independently of the ecological effects); this is specially important in mediterranean-type climate regions where there is a high density of houses in the wildland-urban interface. The most common management action to avoid these disasters are based of fuel reduction (fuel breaks, prescribed fires, etc). However, these actions do not seems to be very successful, at least in crowded regions and where fire occur in extreme weather situations. For instant, in southern California nearly 1000 homes per year have been destroyed by wildfires since 2000, despite their fire management plans. In addition, strong fuel reduction actions have negative biodiversity implications (vegetation degradation, alien invasion, etc.). In a recent paper, Syphard et al. suggest that urban planning could be more efficient in reducing disasters and property losses from fire than fuel management. They found that at the regional scale, fuelbased maps did not predict property loss as well as maps developed using a combination of factors that included housing arrangement and location. Consequently land use planning and housing development policies should be important components of fire risk management plans for the wildland-urban interface. Syphard A.D., Keeley J.E., Massada A.B., Brennan T.J. & Radeloff V.C. (2012). 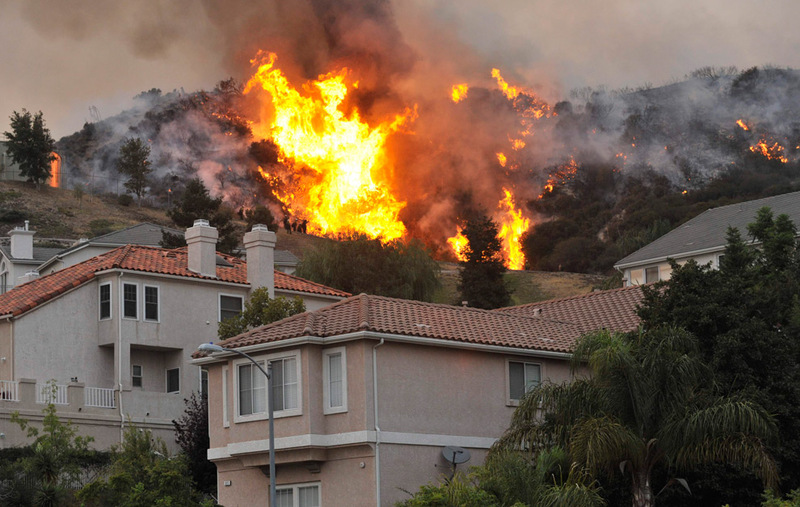 Housing arrangement and location determine the likelihood of housing loss due to wildfire. PLoS ONE, 7, e33954.